Nine of the riders at the starting line of the World Cycling Championships in London on 28 April 1879 knew each other well. They had competed against each other just 5 months before when the winner, Sheffield’s William Cann, had ridden over 1,060 miles in 6 days. Naturally Cann started as favourite again with French champion, Charles Terront, considered to be his closest rival for the fabulous prizes on offer – £105 in cash and a belt said to be worth another £100 (worth many thousands of pounds in today’s money). The contestants could be forgiven for not giving more than a sideways glance to the one newcomer among them, George Waller, a young rider from Newcastle, who had previously won prizes only in minor contests in the north and midlands. George William Waller was born on 12 April 1855 at 11 Back Lane, Gallowgate in Newcastle upon Tyne. His father, James, was a mason from Yorkshire and his mother, Catherine, a local woman. She was 12 years older than her husband and died, aged 58, when George was just 15. The family lived in Elswick when George was a young boy but the 1871 census shows George and his father both working as masons and living at 13 Miller’s Hill, Byker. We know that George worked for a time in York on the building of the Foss Islands Railway, which eventually opened in 1880. 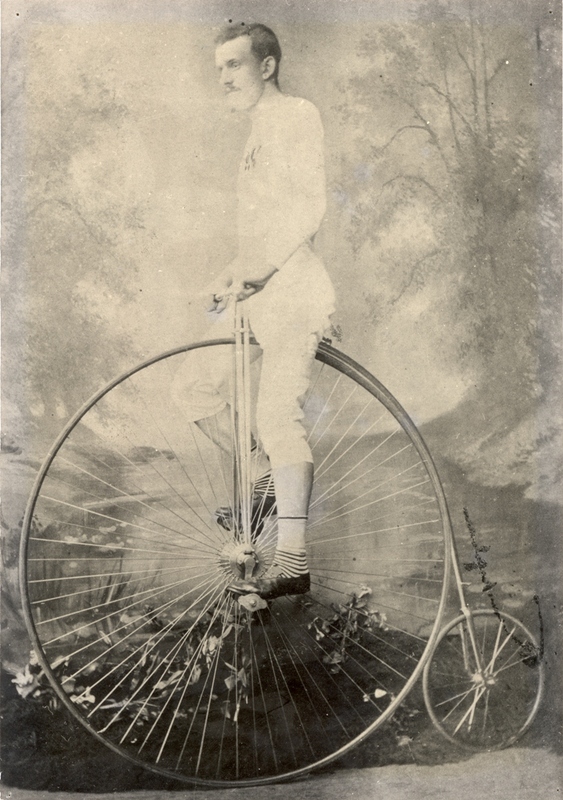 Apparently it was here that he first had the idea of long distance cycling. It was said that, wishing to visit home at weekends, he bought a ‘boneshaker’. His colleagues reportedly thought it a great joke at first but it was reported that he commuted between York and Newcastle with some ease after a hard week of physical labour and was back at work on time on Mondays. Whether this story is true we can’t be sure but it was certainly told during his lifetime and fits in with what we know about Waller: that he was extremely tough, although a modest 5 foot 8 inches tall and weighing only around 8 stones 11 pounds, a ‘compactly framed well set man with no extraordinary muscular development’. Some reports mention that he was also a diver. In 1874 he finished third in his heat in the Great All-England one mile handicap held in Sheffield. The following year he won a heat in Wolverhampton but it was again described as a very poor race. In 1876, he won a heat again in a one mile race in the same city. 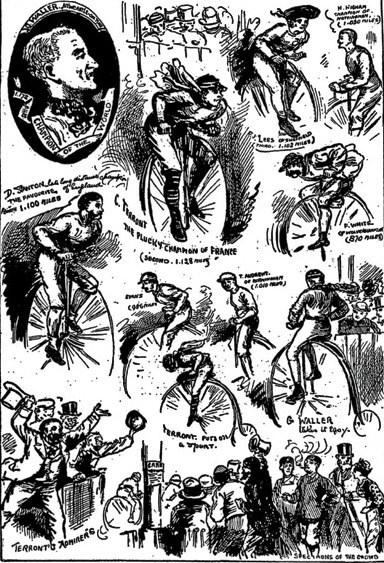 The six day race at the Agricultural Halls in Islington was covered in detail in newspapers across the country. It lasted from Monday to Saturday with riders permitted to spend up to eighteen hours on the track. The reports describe brief rests during the day to ‘shampoo‘, change and eat and just six hours compulsory rest at night. With Cann, the champion and favourite, having crashed on the first day in a collision with Terront, Waller took an early lead, closely followed by the French rider. The crowd of spectators grew as the week went on, with 8,000 cheering on the riders by Wednesday by which time the leaders were taking few rests. By midnight, when the race adjourned for the night, Waller had ridden 878 miles and Terront just over 840. By five pm on Friday, the fifth day, Waller had ridden 1,020 miles on his Hillman and Herbert DHF Premier and so became the first rider to win the prize of £20 offered to any rider who achieved 1,000 miles over six days. He was attended by his brother Tom, along with a Charley Smith and the one hundred miles champion, Walter Phillips. On the final evening, the crowd had swelled to around 10,000 and was allowed into the centre of the tight circuit ‘on extra payment, of course‘. The leaders ‘shaking hands, sped away merrily to the inspiring strains of the Marseillaise’. Waller’s final distance was 1,172 miles, 44 miles more then Terrront. Thank you to Tyne and Wear Museums and Archives for permission to reproduce these photographs. Waller was instantly a sporting hero. He returned to Newcastle via York where ‘admirers gathered round the cab in which he was being conveyed to the station, took out the horse and dragged the vehicle, amid cheers, to the booking office’. The event was clearly considered a success as only a few months later on 1 September, most of the same cyclists took to the track again. There was even more media interest and bigger crowds. 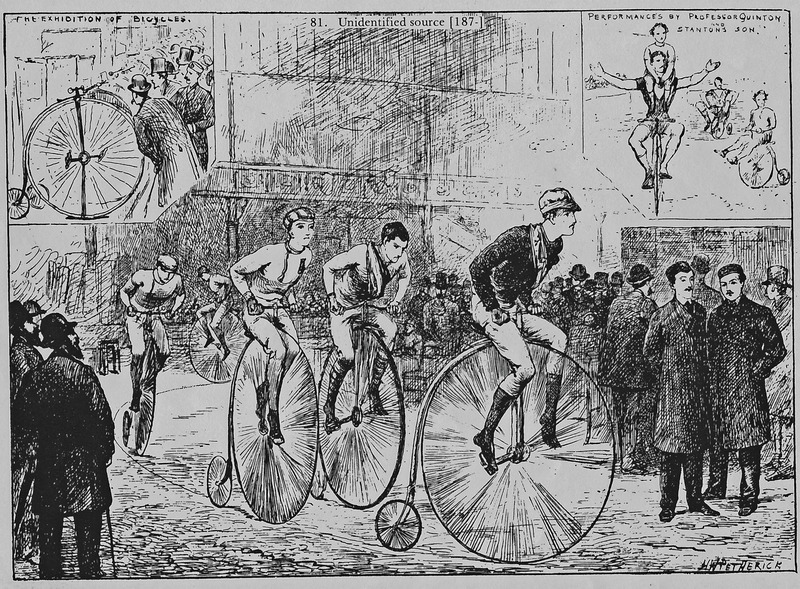 Performers, including Terront’s brother, again performed ‘circus tricks of bicycle riding’ in the centre of the track, helping to create a carnival atmosphere. ‘He wore a little round straw hat, with a fluttering green ribbon, and beneath it such a crop of bright, crisp yellow hair as his Saxon ancestors must have bequeathed him centuries ago, before the invention of either brush, comb or pomatum pot’ (Freeman’s Journal, Dublin). The story of an incident in Morpeth while Waller was training for the race was recounted: apparently, a policeman caught the champion cycling on the footpath and, when Waller failed to stop, threw his truncheon at the bike. It caught in the spokes and brought down the rider, knocking him unconscious. The policeman helped Waller at the scene and nothing further was said about the crime. Waller, as expected, took an early lead but Terront was never far behind. Again there were spills. On the first day, Waller’s ‘machine gave way and he fell heavily though fortunately without hurting himself’. By the second day ‘ this race has assumed an importance far in advance of anything previously known in the bicycle world’ as Waller and Terront had both smashed their previous records. ‘Waller combines speed and endurance in a really wonderful measure and the style in which he rode past opponents was really surprising’. Again the race came down to a head to head between Terront and Waller, with no quarter given. On day three, it was Terront’s turn to fall, grazing his elbow but almost immediately returning to the saddle. On day four, Terront arrived at the track nine minutes late (at 6.09am!) saying that his attendants had failed to wake him on time. The competition between the two men was described as ‘severe’. Waller was reported to have rested only 4 minutes all day and Terront just 2 minutes and 10 seconds. On 7.45am on day five, Waller passed the 1,000 mile mark, with Terront achieving the same distance at 8.54am. By 9.43pm, Waller had passed his previous record. It was reported that neither man dismounted from his bicycle all day. The Frenchman was gaining on Waller, who was unable even to take food from the hands of his attendants. Each time he attempted to, it was said Terront put on a superhuman spurt and was heard to exclaim: I will prevent him from eating and try to starve him! There was controversy too. Waller was accused of cutting corners and cautioned that he would forfeit a lap if he repeated the offence. The alleged misdemeanour was covered in many papers but a letter in ‘The Sportsman’ reprinted in the ‘Northern Evening Mail’ (9 September) denied that he had cheated. It said that all the riders were forced to cut corners at the bottom of the course but rode many yards extra elsewhere. The two men continued their battle on day six and again neither ride stepped from his bike. Finally though, Terront had to admit defeat. 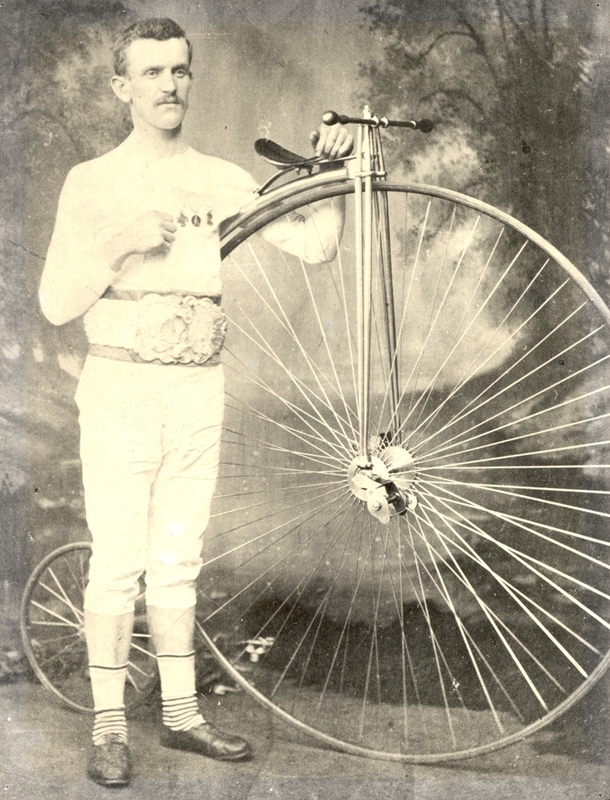 In the final session, in front of a crowd of 12-13,000, the two men rode hand in hand, having ridden the incredible distance of 1,404 miles (Waller) and 1,390 (Terront) on penny farthings. At Darlington the station was crowded and the carriage which the northern party occupied was quite besieged by an enthusiastic multitude’. But in Newcastle, where news of Waller’s expected arrival time had been announced in that morning’s newspapers, thousands turned out at Newcastle Central Station. The scenes were amazing: ‘a reception as has never been surpassed even by the enthusiastic Tynesiders’. Ringing cheers greeted the champion as he stepped from the carriage and he was at once surrounded by a dense crowd who carried him bodily away. The progress from the platform to the portico was painfully slow. The crowd surged about with such force that the lines of policeman were overpowered and driven away’. Eventually a distressed Waller was helped into a cab and driven to his home in Gibson Street, Byker, where thousands more awaited him and demanded that he speak. Eventually a representative came to an upstairs window and thanked the crowd but said the world champion was too exhausted and bashful to talk to them and so he ‘had the pleasure of expressing [Waller’s] feeling of pleasure and pride at the noble reception which his townsmen had given him. 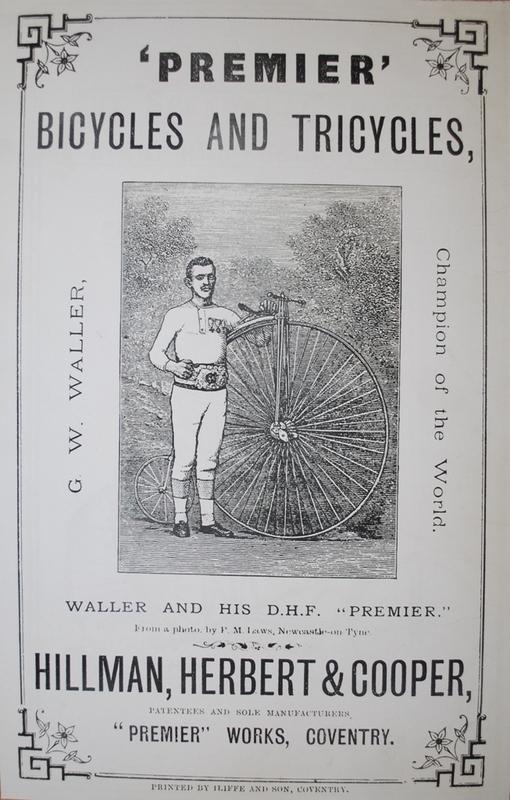 Immediately Hillman and Herbert, the manufacturers of his bicycle, capitalised on the triumph, placing adverts quoting from a letter said to have been written by Waller, expressing gratitude to the company, and using photographs of him on its posters. Waller’s championship belt is held at Newcastle’s Discovery Museum but is not currently on display. The year the Tour de France is due to come to the north of England would seem like an appropriate time to find a way of celebrating the pioneering achievements of Bradley Wiggins, Mark Cavendish and Chris Froomes’ illustrious predecessor. This entry was posted in Group Activites and tagged cyclist, Fenham, George W Waller, Heaton Park Road, Miller's Hill on December 30, 2013 by oldheaton. My aged Aunt (Mary Rees, nee Mann, now 94) told me that a relative (she thought John Waller) had been presented with a sporting belt which was held in the Newcastle museum; she thought this was for boxing but having found this article via another relative in Yorkshire, I feel maybe she was mistaken. The ‘belt story’ would fit the bill except that I have been led to believe that John/George had a sister Elizabeth (my great grandmother b 1850 died 1930 in Gilling West where she went to live with my grandparents William and Margaret Mann) who was close to him and went with him to London at some stage. However I believe her parents to be a John Waller b 1818 whose wife was Margaret. Elizabeth married Henry King from Braithwaite 1847-1928 who worked all his life as a gardener at various large houses in Yorkshire. I wonder if your research might enlighten me? Haven’t done in depth research into the family other than using census and cycling records and obtaining George’s birth certificate, but his parents were called James and Catharine and he had brothers called Thomas and Henry. If anything relevant comes to light when I’m researching the second part of his life for the next blog, I’ll be sure to let you know. Thanks for your reply – look forward to reading more. I wonder if my great great grandfather John Waller was a brother/relative of James Waller (George’s father). They were both born in Kirby Ravensthorpe with a few years of each other? Since I live in Gloucestershire I’m a long way from older records. Hello Ann and ‘oldheaton’, I may be able to shed some light on the queries above. My great great grandfather is Tom Waller, George’s brother, who was also an avid cyclist as well as an Alderman of Newcastle. ‘oldheaton’ is correct in that George’s parents are James and Catharine Waller, with brothers called Tom, James and Henry. Looking back through the family tree, the only John Waller I can find is George Waller’s grandfather, who was born in 1806. James Waller, George’s father, appears to have been born in Kirby Ravensworth. I hope this helps. ‘oldheaton’, a big thank you to you for your research on this topic. I was so excited to see your blog on the Internet and to learn more about my relatives and to actually see what George Waller looked like. The physical likeness and sporting competitiveness have certainly come down through the generations! My Grandmother, Ethel Waller, was born and brought up in Heaton, and spoke very fondly of the area. Ann, I am going to explore the Yorkshire roots of the family next month and am planning a visit to Giggleswick and the surrounding areas, where the Waller family was before the move to Newcastle. In the 1700s, my multi-great grandfather was a publican at an inn in Giggleswick which is still standing and where one can still overnight. So, that is what I am going to do. I think the journey next month will be far more than a geographic one! Thank you so much for your notes, Judy – much appreciated – I envy your trip up to Yorkshire – its about 3 years since I was there on a fleeting visit, but I would like to explore more sometime. I hope your visit throws up some more information for you – best of luck. Somewhere distantly we must be related! Hi Judy, Really appreciate you getting in touch. I had hoped to be able to make contact with a descendant and it’s great that there is a member of the family interested. I plan to write part 2 over the next couple of months and then ideally we’d like to get a plaque put on George’s old house in Heaton. The only problem might be that seems to be in multiple occupancy and we’ll have to trace the landlord and get his permission. Will keep you posted. It’s really interesting to know that there is still a physical resemblance and sporting competitiveness in the family! Good luck with your trip to Yorkshire and keep in touch. Their mother Georgina Ellis (nee Waller) was George Waller’s daughter. Hi Penny, Thank you so much for getting in touch. Do let us know if we’ve got anything wrong! Will be putting Part 2 on the site in the spring and will alert you to it. We’d love to see a memorial to George in Newcastle and will keep you informed of any progress towards that. He was an amazing man! I am his great grand niece, which must make us cousins of sorts, Penny. George’s wife was my great-grandmother’s sister. Congratulations on this very detailed story about the life of George Waller. It has filled-in the background to a name that I only discovered while researching the 19th century six day bicycle races in Britain. I hadn’t heard of him until I found a photo of him taken by a local photographer I was researching in the National Archives. When I Googled Waller’s name, I found the information on your site and was keen to find out more. So thank YOU!